Home > Just How Much Paper Do You Waste? We all know that going paperless will help the environment and save trees. 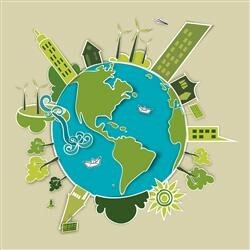 We have all seen the “Going Green” advertisements and social push to protect the planet. But do you know exactly how much paper we really waste? The average office worker uses approximately 10,000 sheets of paper per year according to the US EPA. That’s 20 reams of paper per office worker in the US. In addition, the US EPA states 210 BILLION sheets of paper are wasted annually by US Companies using conventional faxing rather than email or electronic faxes. According to Midpoint International Research, it takes ONE (15-year old) tree to produce HALF of a box of paper. This means that starting to reduce our paper use by even one box a year, can save 2 trees annually. So, what steps can we take to reduce our paper use? 1. Use email instead of fax – This one seems simple, but many of us are culprits. Instead of faxing, create it electronically and electronically send it. If you must fax, use an electronic fax provider – This will save you time and money. 2. Organize and store your documents in a central Electronic Content Management System – Documents will be organized and easy to retrieve and use. You can send documents directly from the system and allow users to retrieve documents. This eliminates the need to print and send documents internally and even externally. 3. Create E-Forms – Most companies, whether you’re a financial institution, Academic, medical provider, insurance company, etc., require some form of physical documentation to be filled out from your customers. By making these forms electronic, you will reduce the use of thousands of sheets of paper. Whether you’re interested in reducing paper waste or just want to save money, Tronitech can help with effective and efficient document imaging solutions. Give us a call or visit our website to learn more.